To build a fence, start by planning where you want to install the fence. Use a string line to lay it out. When arranging the fence posts, affix the end posts first and then add all the posts in the middle. This way your posts will be nice and orderly. Use suitable wood for your posts and fencing. If you use pressure treated wood for the fence, make sure it is insect and rot resistant. Cedar is the most expensive wood to use but it is also most likely the best choice of wood. Cedar has the least shrinkage of fence wood, so it will stay nice and even. Be sure to build your fence completely on your property. Don't let it extend onto a neighbor's property or a public area. Using an oil based wood coating on the finished fence will keep your fence looking new. Follow one of the free fence plans below to build your new fence. Building a wooden fence can be made easy when you have detailed instructions along with helpful tips and you can find exactly that with this fence project. Here are easy to follow instructions on how to properly dig post holes, work with concrete and install vinyl fencing. 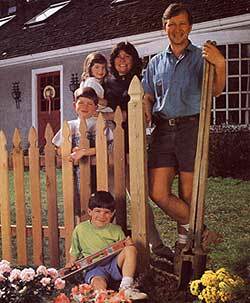 This plan has simple step by step instructions for building a strong and sturdy picket fence. This type of fence works great for when an area is needed to be fenced in quickly. Just follow these step by step instructions. Here are simple steps on how to build a good looking fence out of eco-friendly western red cedar. Build this redwood horizontal plank fence that provides privacy to a sloping lawn. This is a great plan along with useful tips on building a double fence gate. Free plans for a picket fence. Here are detailed instructions to help you build a wood panel fence to be placed around a garden. Download free directions and diagrams to build your own corner picket fence. How to choose a fence, what you will need and how to install it. This fence is designed to be built by the intermediate carpenter. This project has everything you need to know on designing and building a wooden fence, gate or both.